The Modify Server Config for ARK allows the customization of various aspects of the server, such as changing player level caps, harvesting amounts, tamed dino damage and resistance, and much more. This tool takes all of the data within and saves it to GameUserSettings.ini and Game.ini. Any manual changes made to these files by using either FTP for PC users or the two text boxes for PS4 users, will be overwritten. Please retain a copy of all manual edits you do for these two files. The config file is broken down into the following sections: Change Log, Base Config, Players Levels, Dinosaur Levels, Per Level Stats Multiplier, Dinosaur Config (incl. DLC), Engram Configuration, Harvestable Items Multiplier Override, Procedural Map, and Custom .ini Code. This section is a simple list of the most recent additions to the configuration tool for ARK: Survival Evolved. Not all settings for ARK may appear in this configuration tool. If there any specific settings that may be missing, please let us know. Basic configuration for the server, including MOTD, difficulty values, cluster/tribute transfer settings, and most other game multiplier settings. Due to the sheer number of settings available in this section, only a handful will be specifically written in this section for now. In cases with Alpha dinos or "wyverns", these creatures can have levels beyond the max level set with the OOD value. Be careful when playing on maps where these creatures are a common threat and make sure to be prepared. There are available options that can be used to control what players may or may not transfer over to other ARKs in the same cluster or across the same servers. These options are found in the Modify Server Config tool near the top. 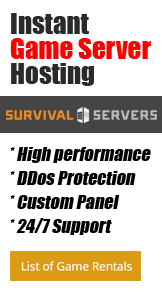 Prevents players form uploading dinos, items, or survivors from outside the server and/or the cluster environment. This option prevents players from downloading survivors from other servers. When they join the server, they will be prompted to create a new character. This option prevents players from downloading dinos from the Obelisk. This option prevents players from downloading items from the Obelisk. This option prevents players from uploading survivors from the current map to transfer to either another server on the cluster or off of the server entirely. This option prevents players from uploading from to the Obelisk. This option prevents players from uploading items to the Obelisk. A cluster environment is needed to allow transfers between PC servers. At this time, we can only facilitate two servers in a cluster environment, with both servers being managed through the same control panel. Both servers will use the same Game.ini and GameUserSettings.ini files, but can have separate launch parameters for further customizations. To enable transfers over between PS4 servers, the Cluster Code value, found in the control panel, needs to be identical to the server you wish to transfer over. It is possible for multiple servers from multiple owners to share the same cluster code, allowing transfer between one to another. Lower numbers decrease the speed at which babies eat their food. If you are having issues where you are unable to form Tribe Alliances, you will need to disable the option for Prevent Offline PvP. Per the developers, it is not possible at this time for tribes to have alliances while also preventing bases from being raided while the tribe members are offline. Manually editing the Game.ini file. More information about doing such for both PC and PS4 users can be found at the link below. Similar to player levels, this allows you to modify the levels a tamed dino will receive after the point that they are tamed. Leveling bonuses from Taming Effectiveness will not affect how many levels a dino can earn. In your Dinosaur Levels section for your server, you have set 150 levels for dinos. After making the changes, you knock out start taming a level 100 Raptor. By keeping the Taming Effectiveness high by feeding the Raptor its preferred Kibble, the Raptor is tamed and becomes level 110. As a result, your now 110 Raptor can gain 150 levels, from your Dinosaur Levels Configuration, to reach a maximum level of 260. These multipliers adjust the stats of players, tamed dinos, and wild dinos. NOTE: There is a known issue with transferring between ARK servers that have high base player stats, as this may cause an obscenely high number of Health, Speed, etc. To correct this, reduce the base player stats on the server experiencing the issue back to 1. This section contains various fields that can be used to modify ARK's default dinosaur spawns, including disabling a specific dino from spawning entirely. Any changes made to the Dinosaur Config section should be followed up by an in-game DestroyWildDinos command to apply any changes to spawning percentages or replacements! Unchecking this box will completely remove the specific dino from spawning on the map. Unchecking this box will make the dino resistant to any taming methods. By default, this value is populated with the same name as the dinosaur in the section. Changing this value to another dino will attempt to replace all spawning sets with that dino. NOTE: There are issues if dinos that are specific to water from being replaced by land only dinos, and vice versa. This value is referenced as SpawnLimitPercentage and is a value between 0 to 1. Any value higher than 1 has been observed to prevent spawning of that particular dino. Example values: 0.25, 0.5, 0.667, 1 ... would correlate to 25%, 50%, 66.7%, and 100% of normal spawn limit values. This value is referenced as SpawnWeightMultiplier and directly influences the spawning chance of a particular dino. A higher weight value means that the dino has a higher chance of spawning in a particular area that it can be found. Higher value means more damage that dinos afflict on players, gathering nodes, or other dinos. NOTE: At this time, specific attacks or abilities cannot be modified, such as the Gryphon's Dive attack or the Raptor's Pack Call. This affects the overall damage resistance of tamed and wild creatures. If a value of 0 is set, the dino will be invincible to torpor or other damage. NOTE: Damage Resistance affects Torpor as well. A specific value for modifying Dino Torpor does not exist at this time. This section allows for easy editing towards the game's engram configuration: How many engrams are needed to learn something, what level needed to learn, and if per-requisites must be learned before unlocking this engram. Alternatively, the specific engram can be disabled entirely. This section is for setting the individual multipliers of harvestable items. NOTE: If you are experiencing lag when harvesting items, change the value of Harvest Amount Multiplier to 1 and then change each individual item in this section to the desired multiplier. This is a bug with ARK's gathering system and a harvesting node's health. However changing the specific multiplier prevents server lag from occurring. If you are using Structures+ and wish to disable the ability to pickup walls, foundations, etc. that you have placed down, you will want to add the following to the Custom .ini Code section. NOTE: A Custom .ini Code box for Game.ini is planned for the near future. Any manual changes that need to be done to Game.ini will require FTP Access and a text editor. This page was last modified on 7 April 2019, at 09:39. This page has been accessed 5,644 times.